Boresnake 9 mm …quick as a strike? Do you spend too much time cleaning your guns? The Hoppes Boresnake can help. The 9 mm Boresnake was designed to decrease gun cleaning time by incorporating a cleaning rod, bore brush and cleaning patch into one product. 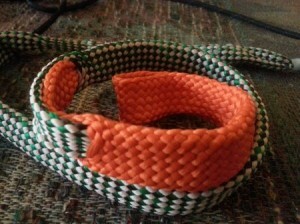 Essentially a cotton weave rope with bore brushes embedded into it. Just pull it through the barrel. 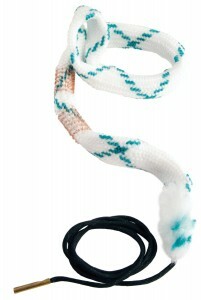 I have used Hoppes Boresnakes for many years. The 9 mm was one of my favorites and was used on my Glock 17. It made cleaning the Glock very easy and fast….5 minutes. It just doesn’t make sense for me to use a cleaning rod, bore brush, bore jag and cleaning patches…it’s just too much stuff. There’s an easier way….Boresnake. I have used many gun cleaning rods and shotgun cleaning rods in the past 35 years. I can tell you which ones are the best, at least in my opinion and why. I only use Carbon Fiber gun cleaning rods because they are lightweight, unbreakable and will never damage a gun barrel. They do not cost much more than a steel or brass cleaning rods and are worth the money. Steel, brass and aluminum gun cleaning rods can become embedded with dirt or sand and then can scratch the gun bore. A scratched bore will ruin accuracy. All of the gun cleaning rod brands I listed above have a comfortable handle with a roller bearing attaching it to the rod. A roller bearing ensures the handle rotates while the rod and brush engage the barrel rifling and turn easily. They are good quality cleaning rods and will last many years. Most carbon fiber cleaning rods cost about $30. They are well worth the money. 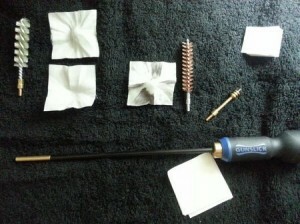 I have used aluminum gun cleaning rods for many years, before I knew why they are not good. I remember seeing aluminum shavings on the rod and on my gun cleaning mat. I never thought about it too much back then. I also never thought about how soft aluminum is and that sand or dirt could get embedded into it. I also remember stripping the threaded segments more than once or bending them. Aluminum is not very strong and can be easily bent. These issues are avoidable with a good carbon fiber gun cleaning rod. Aluminum gun cleaning rods are certainly cheap but they can damage a firearm very easily. Steel gun cleaning rods are certainly popular but are they a good choice? I believe they are not for the simple reason, cleaning a steel gun barrel with a steel rod could cause scratches in the bore. In order to prevent scratching a gun bore, you need a softer metallic material or a non-metallic material. Carbon fiber (non-metallic) is hard but it will not scratch metal. There are coated steel gun cleaning rods available that do provide a protective barrier for the gun bore but if any part of it gets scuffed or worn away then you could experience a problem of scratching. When it comes to shotgun cleaning rods, you can use aluminum or brass as well as coated steel and carbon fiber. Shotgun barrels are smooth bores, most of the time, and can’t get damaged enough by a metal cleaning rod to change its shot pattern. Rifled slug barrels are a different story and should be handled like a regular rifle or handgun, cleaning wise. Aluminum, brass and coated steel will work fine on any shotgun other than a $20,000 double. I used aluminum and brass cleaning rods on my Browning Citori and Maxxum shotguns. I’ve also used Boresnakes with great success. Carbon fiber gun cleaning rods are most likely the best based on safety and durability. 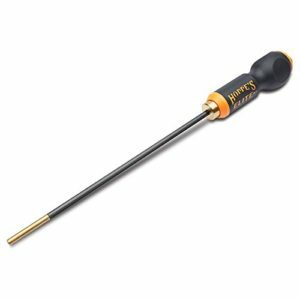 Hoppe’s makes some really nice carbon fiber gun cleaning rods at a great price too. Hoppe’s makes a really nice ergo handle with ball bearings. It’s a great cleaning rod. I have a lot of people asking me about shotgun cleaning rods…aluminum, steel, carbon fiber, coated or what? This is an easy “no brainer” “hands down” best solution to cleaning a shotgun barrel. Why? Because it’s effective, easy and fast. AND it will not harm a barrel. Now let’s talk about the other options…shotgun cleaning rods. Shotgun cleaning rods usually come in steel, carbon fiber, coated steel and aluminum. Aluminum is common because it’s cheap and lightweight. It’s also soft, so it will not damage a steel shotgun barrel by itself. However since aluminum is soft, it can get sand and dirt embedded into it’s surface. If you ever drop an aluminum shotgun cleaning rod on the floor or outside, Throw It Away!!! It will most likely have sand embedded into it. The sand or dirt will definitely scratch the inside of your shotgun barrel. Don’t do it! So not only is aluminum dangerous because it has the potential of scratching the inside of a shotgun barrel but it can also leave shavings inside the barrel. Aluminum is very soft and if the rod rubs against the chamber or muzzle, aluminum shavings can be scraped off and left inside the barrel. You don’t want this. Bottom Line…don’t use aluminum. Steel shotgun cleaning rods are not soft like aluminum so they won’t get debris embedded into the surface BUT steel rubbing against steel is not good. There is the risk of scratching the bore if you let the rod come in contact with the bore or choke tube. Don’t use bare steel cleaning rods. If you must use a traditional shotgun cleaning rod then go with a coated steel rod. The coating will protect the shotgun bore from scratches. Foreign debris cannot get embedded into the coating easily either. The Boresnake is a better option though. Carbon Fiber cleaning rods are the best traditional rods available but at a higher cost than coated steel cleaning rods. Carbon fiber is strong, hard and lightweight. It’s the King of cleaning rods. It will not scratch or embed easily with debris. They are excellent!!! Here is the Ultimate shotgun cleaning solution/rod. 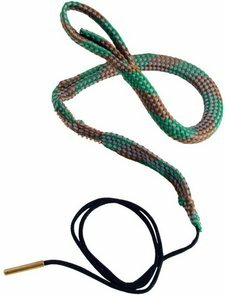 It’s the Boresnake…a braided cotton rope with bronze bore brushes embedded. You simply apply gun cleaner and pull it through the barrel several times. I use one on my Browning Maxus Hunter. 3 pulls and I’m done…about 3 minutes total cleaning time. It’s so Simple!!! Why bother with rods and jags and brushes? It’s also washable and can be reused over and over. So what is the best rifle cleaning rod available? Tipton also makes nice carbon fiber rifle cleaning rods but they are a little more expensive and the handle is not quite as nice as Gunslick Pro. I have a Gunslick pistol cleaning rod and a rifle cleaning rod. I will not buy any other brand. 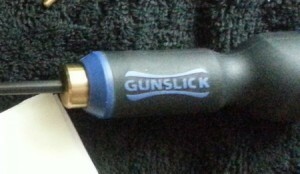 Once you use a Gunslick Pro rifle cleaning rod, you will know why they are the best. Tipton gun cleaning rods are an excellent value. They are made well and last a long time. They offer gun cleaning rods in stainless steel and carbon fiber. Tipton offers one piece cleaning rods and 3 piece and in every caliber from .22 to .45. All Tipton cleaning rods feature a ball bearing handle that rotates freely. Tipton carbon fiber cleaning rods are simply the best gun cleaning rods. Carbon fiber is the best material for a gun cleaning rod. It will not scratch or wear a barrel even if used carelessly. Carbon fiber also does not embed with sand or grit from the ground like aluminum rods do. And lastly, carbon fiber rods flex greatly but recover to their original shape. Metal rods can bend and become useless. Tipton Max Force cleaning rods are special rods with a sliding/movable handle grip that allows you to put more force on the rod without bending it. You position the handle close to where the bottleneck is and apply more force. The grip/handle will clamp onto the rod in any position. The rod will not bend because the length of rod where the force is being applied is supported and shorter in length. These are great for small bores where the rod is very slender and very long. You can easily use a rifle cleaning rod for pistols. Tipton stainless steel cleaning rods come in 3-pieces and are available in .22 caliber but can be used for larger calibers. If you want a take-down style cleaning rod that is easy to transport and/or fit into a cleaning case then the 3 piece Tipton is ideal. However it is bare stainless steel and could scratch a gun barrel. Use a bore guide when using anything other than a carbon fiber or coated steel cleaning rod. Carbon fiber is much better and not much more expensive.